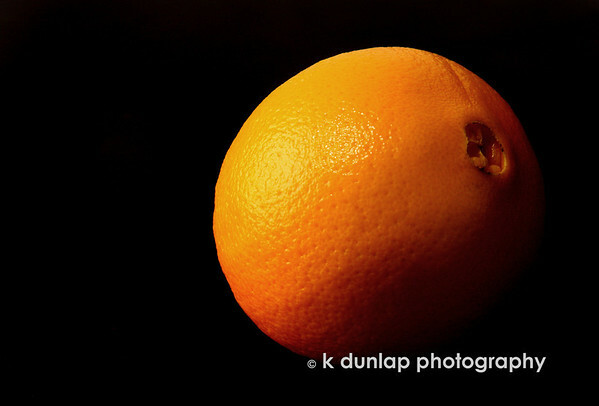 01.03.10 = Just an orange. Yesterday morning I got up and felt really inspired and thought I would go out on a photo shoot to shoot this tree I’ve been wanting to capture. Thinking I was so brave to fight the 12 degree temperature, I bundled up with my rag socks and multi layers of clothing. I knew exactly where I was headed and what I wanted to capture. I tromped up a hill through the wet grass and snow to shoot this tree. When I finally got there and began to shoot, I just knew it was going to be a bust. The light was crummy, there was no snow on tree, it was muddy… Feeling defeat and peeling off several layers of clothing in my car, I headed home. So, this is it, an orange from my refrigerator. I was playing around with lighting and some backdrops. I think I need to stick with some studio work on these cold days. This morning looks to be a better morning…the sun is peeking out but it’s only 7 degrees. I think I’ll stick with the inside shots today? The lighting is great how it radiates in layers from dark to bright. Very nice indeed. Equal to your tree picture you wanted? Keep us posted. Fantastic shot! Great exposure and composition. Nothing like an ordinary orange, especially a navel orange like the one you have here. I grew up in an orange grove, and just the sight of one makes me nostalgic. love that light -- wonderful color and shadows, too! If I could take photos like this indoors, I'd never leave my house! Live to fight another day! I really like the simplicity and crispness of this shot though, all a result of the great lighting!! The orange color beautifully pops out in black. Nice capture !